About two years ago, I launched a small side hustle dog-sitting for neighbors. It was a profitable side gig that allowed me to earn extra cash in my spare time. But one of the things I hadn't prepared for when budgeting my startup costs was insurance for my business. I quickly found out it was necessary. My good friend who had encouraged me to take up pet-sitting was watching a dog for a client. She must not have closed the dog's crate all the way, because he escaped one night and destroyed the owner's expensive silk Oriental rug. The owners took her to court, and she ended up owing them over $30,000. Because she didn't have insurance, she was on the hook for the replacement cost herself. Unfortunately, my friend's story isn't that uncommon. Many side hustlers run businesses without insurance, leaving them at risk if there's ever an accident or error. Whether you're a freelance graphic designer, dog-sitter, baker, ride-share driver, or housekeeper, insurance can be an essential safeguard for your business. 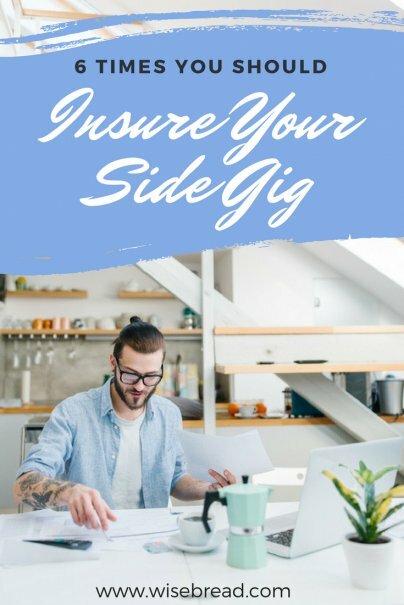 You might think insurance is unnecessary because your gig is too small, or perhaps you work solely from home. However, mistakes and accidents happen all the time in all industries. Here are five times you need an insurance policy. If you have customers visit your home or store — maybe you opened a hair salon, or you run child care services out of your house — there's a chance your customer could get injured on the premises. The client could sue you for damages, leaving you on the hook for tens of thousands of dollars (if not millions!). An insurance policy can protect you from this liability. Maybe you're a personal assistant or you run a housekeeping business, and your client trusts you to work in their home. Even if you're careful, it's all too easy to knock over a precious heirloom or spill a drink on a designer sofa. Without insurance to cover your mistake, you might have to compensate the owner for the damage on your own. Children and animals present unique challenges, because they can be unpredictable and have a knack for getting into mischief. Whether it's an incident while baby-sitting a child or dog-walking, you could be held responsible for legal or medical fees. It's important that you insure yourself to cover these bases. If you're a graphic designer, bookkeeper, or writer, you might not think you need insurance. However, your clients likely entrust you with company information that is sensitive or confidential. If your computer is stolen or you're hacked, that information could be compromised, and your clients could take legal action against you. Uber and Lyft offer their independent contractors supplemental insurance in addition to requiring them to have their own auto insurance policies. However, don't think that means you're completely in the clear. Often, the company-supplied insurance has strict limitations and is inadequate. For example, if you're a driver with Uber, you have third-party liability coverage of at least $1,000,000, uninsured or underinsured motorist bodily injury coverage of at least $1,000,000, and contingent collision and comprehensive coverage with a $1,000 deductible only when you're on your way to pick up a rider and until you drop them off. The lesson here is that even if the side gig company offers some sort of supplemental insurance coverage, it's probably not comprehensive enough to cover all of your bases. It's a good idea to look for your own supplemental policy to ensure you're fully covered. In many industries, you can get an insurance policy for under $500 per year. If you're not sure where to start, contact your personal insurance agent to see if they offer business policies. If not, you can also use InsuraMatch to find out what insurance you need and get quotes for the necessary policies.